Belize: Sovereign & Strong, Together As One – This September and Beyond! Posted: Tuesday, September 6, 2016. 2:39 pm CST. By BBN Staff: SMART, the leading most innovative telecommunications company in Belize, is holding a Soca or Surrenda raffle this month. To enter the raffle, SMART users need to send a message to UWIN (8946) and in the body of the message type: WIN. 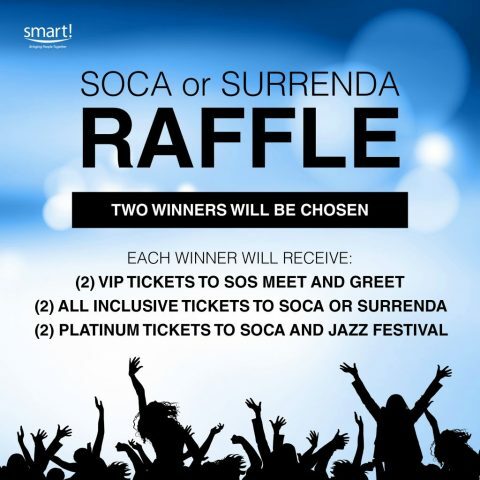 Both winners will receive: 2 VIP tickets to SOS Meet and Greet being held on September 15th at Club Elite, with an opportunity to meet the SOS artists; 2 ALL INCLUSIVE tickets to Soca or Surrenda on September 16th; 2 PLATINUM tickets for Soca and Jazz Festival on September 20th! There are no limits to the amount of times a customer can enter. Each text message costs $0.50 or $0.44 (plus tax) for Prepaid and PostPaid customers, respectively. Winners will be announced on Thursday, September 15th, 2016!